Sod is a great way to have an instant Lawn. Sod is the process of transplanting developed grass to your Lawn. 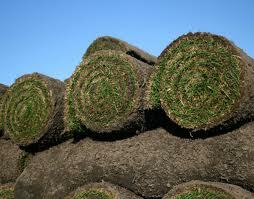 Sod is typically grown on a sod farm, cut and installed in rolls or sheets to create a new instant Lawn. Fill out the form today for a free estimate on your sod installation. Green Garden Landscaping can prepare your site for sod and install the sod for your brand new yard. One of the most important parts about installing sod is site preparation. Your Lawn must be graded for optimum drainage to prevent standing water in the Lawn. The soil must also contain proper nutrients to promote sod growth. Be sure to contact us for proper sod preparation. Installing the sod should be done immediately after site preparation. call today for professional sod installation. After the sod is installed it must be maintained. Newly installed sod must be watered every day until the roots begin to establish. Once the sod is installed it is best to begin proper Lawn maintenance. Proper fertilization and Lawn mowing is a must for a healthy Lawn. Sod can be installed as long as the sod farms are cutting sod in NC. But, It is best to install sod in the fall or the spring. This will allow the roots to develop to withstand the hot NC summer. Contact us for your free estimate.